During VTS testing, shell commands are used to execute a target-side test binary, to get/set properties, environment variables, and system information, and to start/stop the Android framework. You can execute VTS device shell commands using the adb shell command or the VTS shell driver running on the device (recommended). The VTS shell driver is an agent binary that runs on the device and executes shell commands. By default, VTS uses the shell driver if the driver is running on device because this method has less latency than using the adb shell command. Figure 1. VTS shell driver. The VTS framework supports multi-device testing where each Android device is represented as an AndroidDevice object in base runner. 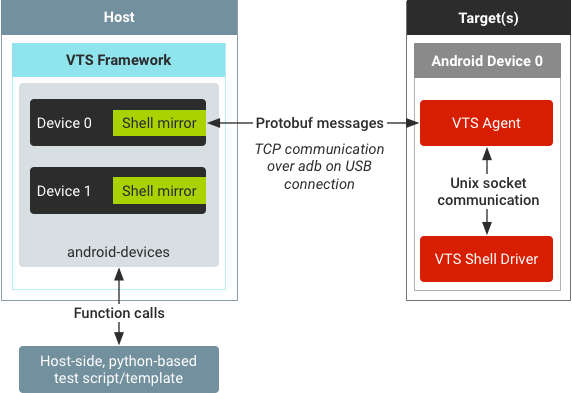 By default, VTS framework pushes VTS agent and VTS shell driver binaries to each Android device and establishes TCP connections to the VTS agents on those devices. To execute a shell command, the host-side Python script makes a function call to the ShellMirror object inside AndroidDevice object. The ShellMirror object packs the shell command texts into a protobuf message and sends it (via the TCP channel) to the VTS agent on the Android device. The agent running on device then forwards the shell command to VTS shell driver via the Unix socket. When the VTS shell driver receives a shell command, it executes the command via nohup on the device shell to prevent hanging. Stdout, stderr, and return code are then retrieved from nohup and sent back to VTS agent. Finally, the agent replies to the host by wrapping the command result(s) into a protobuf message. Reliability. The VTS shell driver uses nohup to execute commands on default setting. As VTS tests are mostly lower level HAL and kernel tests, nohup ensures shell commands do not hang during execution. Performance. While the adb shell command caches some results (such as listing files in a directory) it has a connection overhead when performing tasks such as executing a test binary. VTS shell driver maintains an active connection throughout the test so the only overhead is USB communication. In our testing, using VTS shell driver to execute a command with 100 calls to an empty gtest binary is about 20 percent faster than using adb shell; the actual difference is larger since VTS shell communication has extensive logging. State-keeping. The VTS shell driver maintains a terminal session for each terminal name (default terminal name is default). Environment variables set in one terminal session are available only to subsequent commands in the same session. Extendable. Shell command communications between VTS framework and device driver are wrapped in protobuf to enable potential compression, remoting, encryption, etc. in the future. Other possibilities for improving performance are also available, including device-side result parsing when the communication overhead becomes larger than result string parsing. Additional binaries. VTS agent files must be pushed to device and cleaned up after test execution. Requires active connection. If the TCP connection between host and agent is lost during testing (due to USB disconnection, port shutdown, device crash, etc.) either intentionally or unintentionally, a shell command cannot be transmitted to the VTS agent. Even with automatic switching to adb shell, the result and state of the command before disconnection would be unknown. The return object from shell command execution is a dictionary containing the keys stdouts, stderrs, and return_codes. Regardless of whether the shell command is provided as a single string or a list of command strings, each value of the result dictionary is always a list.